Ozark Christian College students Micah Funderburgh (right), who plays for the Too-Ya-La-Kekt (or "Thunder Arriving on the Plain") team attempts to pass the disc to a teammate as opponent Ethan Humphrey of the Wolf-Pack plays defense during the semi-final intramural game of Ultimate Thursday evening, Oct. 3, 2013, at OCC. The Wolf-Pack ended up winning the game and will play in the championship at 6 p.m. Monday, Oct. 14. 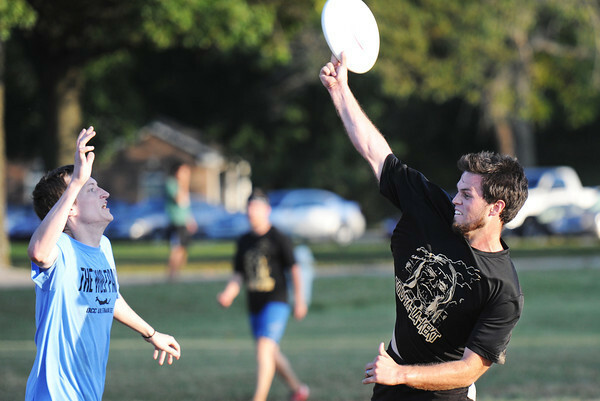 Ultimate is a game with similarities to soccer but uses a disc instead of a ball.